About one in five doctors has stuck with pen and paper during the clinical exam. The rest have adopted some form of technology in the exam room. ACP Internist followed up on its cover story on technology in medical practice by asking its readers, "Which of the following devices, if any, do you use during a clinical exam?" Respondents could any and all that apply. 30% use their smartphone in some way. 25% said they use a desktop computer. 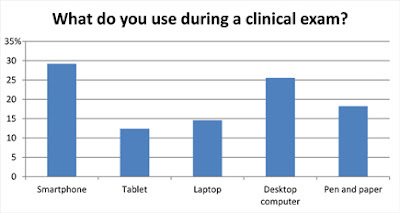 Nearly 15% said they use a laptop computer, and surprisingly, tablets (such as the seemingly ubiquitous iPads) came in last, with only 12% saying they used one during a clinical encounter. Despite the iPads getting all the hype, and their heavier clinical use in Europe, American physicians say the tablet just isn't ready for daily use. And medical IT staffers say they're not secure enough yet. ACP Internist's next poll asks doctors if they've been affected by the recent drug shortages seen for many medication classes. Tell us how they've impacted you or your patients.